From the October 24,2005 Issue of Time Magazine; Posted Thursday, October 13, 2005. Art of the Street is a photo essay by Time Magazine on how some artists are recreating the urban landscape. 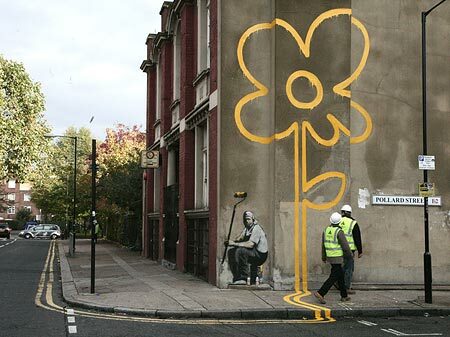 It features works of various graffiti artists such as Banksy and Gore-B. The prolific Gore-B, who is based in Brooklyn, puts up paintings and illustrations inspired by vintage photos. 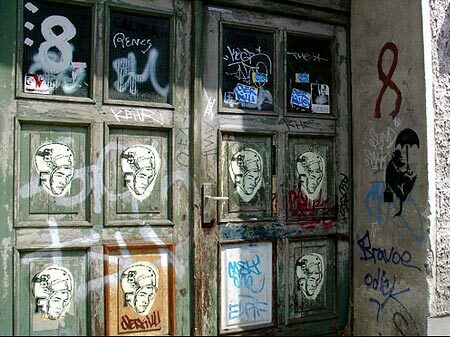 The Brooklyn-based trio Faile produced this series of stenciled heads on a door in Berlin. Their work often defies quick interpretation. Says Aiko, the group’s lone female member: “I take time to put it on the street so that you can spend time thinking about it.” To the right is a stenciled rat by popular British artist Banksy.